Everyone loves that fresh new shoe look (and smell) but keeping them that way is sometimes harder than it sounds. Random scruffs and scratches will appear but taking regular care and using the correct products will keep your trainers looking good as new. Read more Men's Life features and check out our Store. 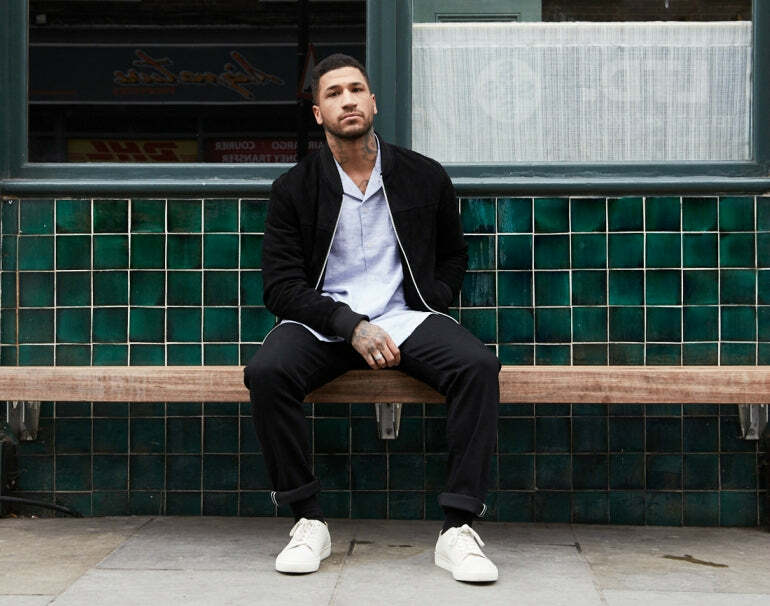 Trainers are a key piece to any outfit and part of everyone's wardrobe so taking care of them should be an essential. Giving your trainers a quick wipe over with a pack of baby wipes you've found in the cupboard may give them an instant refresh, but using proper products and taking a more in depth approach to caring for your leather trainers will be better in the long run. Leather shoes need as much care, or even more, as suede or patent shoes. Leather is a natural material, so just like your skin, the leather needs to retain it's moisture otherwise cracks or dry areas can show. A shoe cream, polish or wax will help protect your shoes, and lengthen the last on them. Here at The Idle Man we have investigated what the best products for your leather trainers are. Coated leather is still very similar to leather, the only main difference is that the leather is coated with a chemical finish which makes the leather stiffer and a lot less flexible. The coated leather is also more restricted when it comes to breathability and is therefore more likely to crack when in dry conditions. It is therefore essential that you look after your coated leather trainers with oily or waxy finishes and conditioners to buff up the shoes and remove any marks. 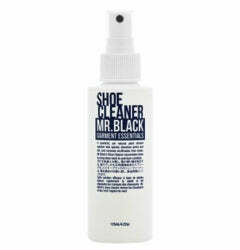 Mr Black products aim to clean and protect your clothes and shoes without being too harsh on them. They believe that washing your clothes or shoes is bad for them and it is just as easy to keep them looking clean without being too severe when it comes to washing. This natural plant derived solution is powerful enough to remove any scuff marks by dissolving the grime and dirt with a biodegradable solution meaning your trainers will stay on point and fresh in a like-new condition. One bottle of this spray can clean up to 100 pairs of shoes so it is definitely worth the buy. Mr Black also provide similar sprays for your clothes, whether its a stain that needs removing or a general refresh there is a wide range of products for every material. If you follow their three simple steps, refresh, cleanse and protect, your clothes and shoes will remain in the best condition possible. 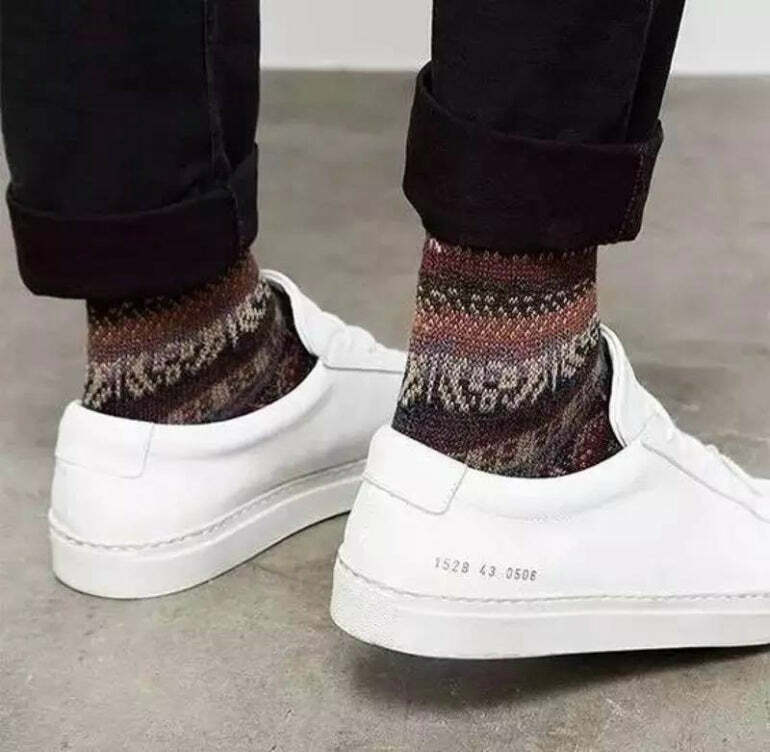 Cleaning is an essential part to everyone's life, whether it's yourself, the dishes, the house, your clothes and of course, in this case, your shoes. Crep Protect offer that bit of TLC that your trainers need. The shoe care kit includes a brush that can be used on almost every material, the brush is delicate enough to not ruin the material but is effective enough that it keeps your kicks clean. With the brush comes the Cure solution which is the master behind all the magic. Once you're happy with how new your trainers are looking, a microfiber cloth is used to buff up the shoes to give them that out of the box shine. 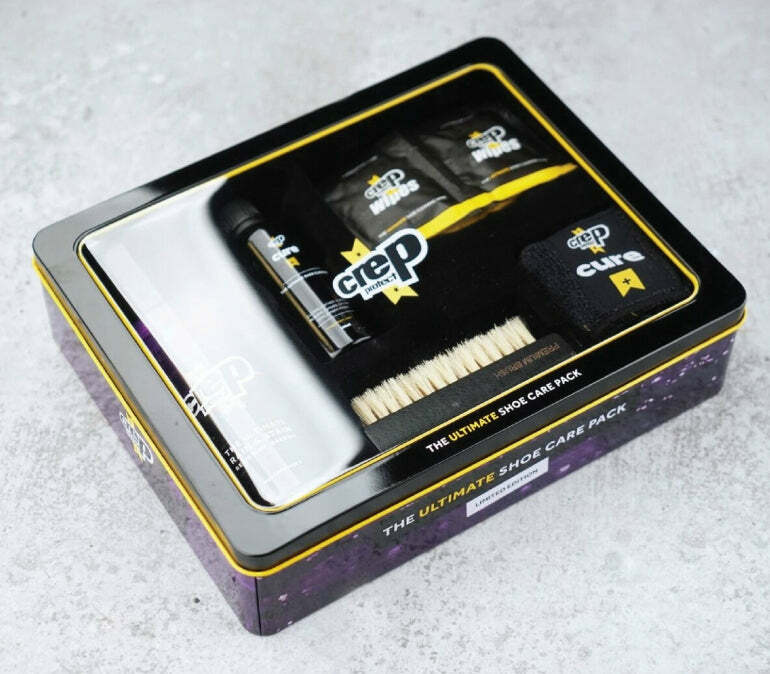 Crep Protect have come a long way and recommend thoroughly cleaning your shoes every one or two months, in the mean time their wipes can give your creps an instant refresh. Figuring out how to clean leather shoes is a set of three simple steps. To start you'll need a shoe brush that you should use to remove any excess dirt before you begin with any shoe cream or polish. This will brush off any dust, dirt or anything else you've managed to spill on your feet. Once this is done you can use your leather shoe cream to wipe over the entire shoe, minus the laces. Use a clean cloth and don't over do it with the cleaner. Leave this to dry for 10 to 15 minutes and finish off the clean by buffing them with a microfiber cloth to increase to shine and show off your newly cleaned shoes. Shoe wax will give your trainers a high shine. It will help clean, polish and protect your leather trainers adding in the moisture it needs to stay looking crisp and smooth. 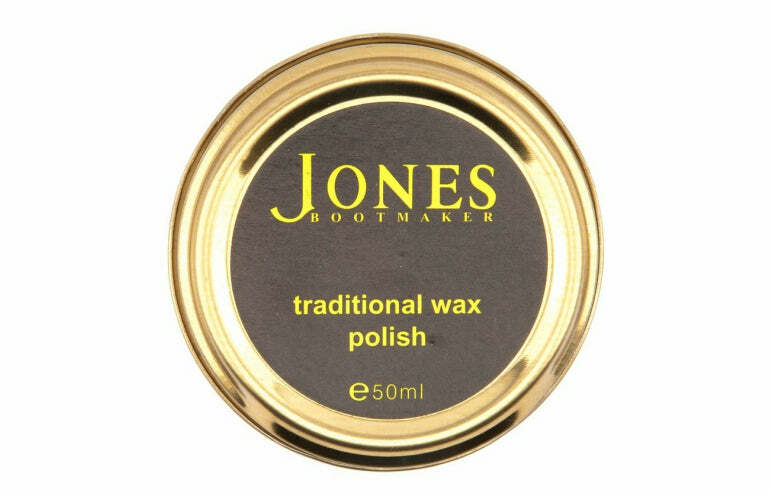 When buying shoe wax, finding one of the best ones that won't break the bank may be difficult, but, Jones Bootmaker is here to save the day. 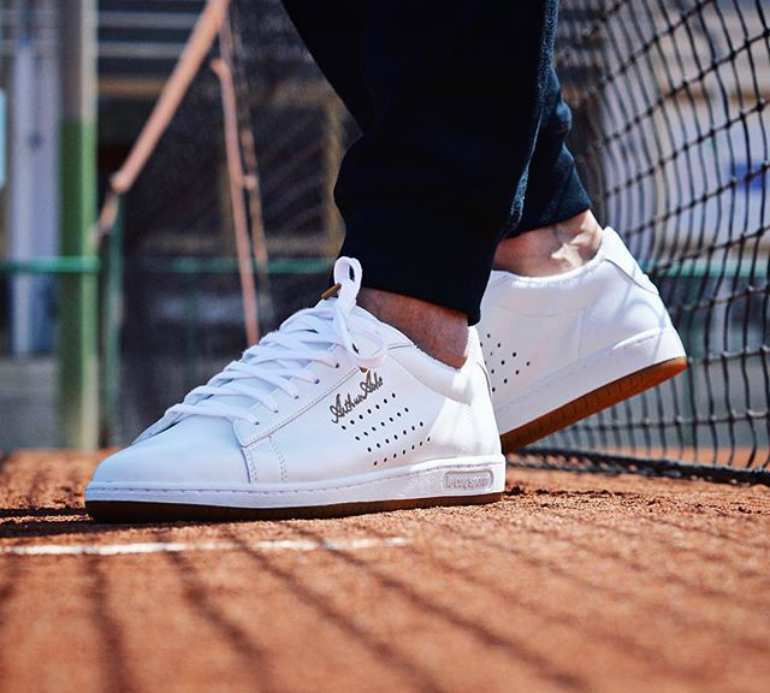 Their wax polish will revamp the leather on your much loved trainers, and with black, brown, beige and neutral colour options they have every type of colour catered for. Leather shoe care is easier than you may think and won't take up all the time in the world. Polishing fairly regularly is recommended as it helps the leather maintain it's original appearance and texture. Before you do polish your leather trainers always clean and dry them beforehand. This can be done using a leather shoe cream and leather shoe care products. Brush the trainer clean with a soft brush and remove any laces as you don't want to get the wax on these when polishing the tongue of the shoe. Apply a thin layer of wax onto a clean polish cloth and buff your shoes until the desired shine. Ideally leaving them overnight before giving them a final buff with a soft brush is preferred but leaving them for 15 to 20 minutes, until they're dry, will do just the trick. To keep them extra protected and waxed for longer a leather shoe protector will make the waxing worth while. So far we know that keeping your trainers clean and in the best condition will lengthen their trainer life and always look good as new. But keeping them this way can be difficult. This is where the protector comes in. 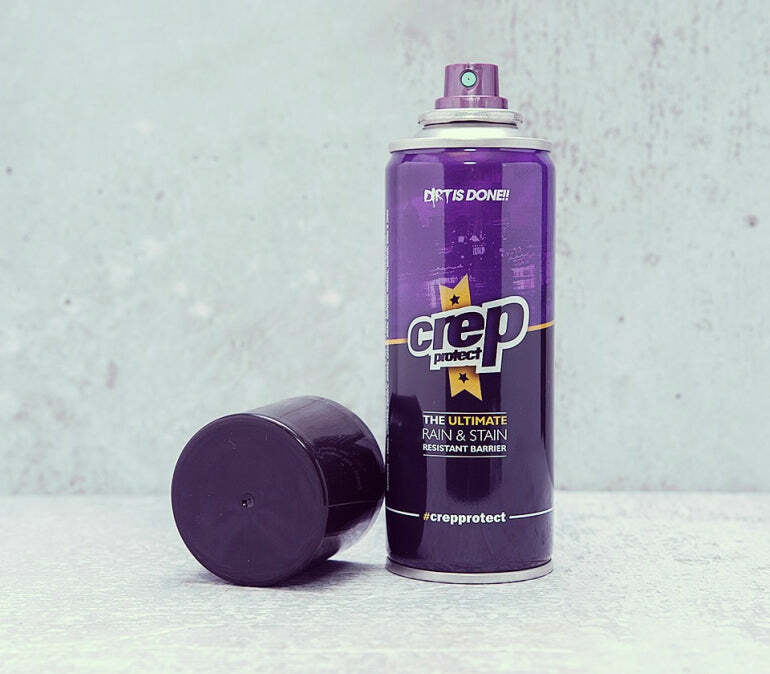 Crep Protect offers a neutral protector spray that can be used on leather and suede to protect from rain and stains. The neutral colour will allow you to use it on nearly all pairs of trainers (and shoes) so this product is very useful when it comes to protecting your shoes. With up to four weeks of protection from liquids, your trainers will remain squeaky clean. If you have your leather trainers and they've been worn in quite well, you may want to waterproof them. This can increase the life of them and will keep them waterproof and protected for longer. 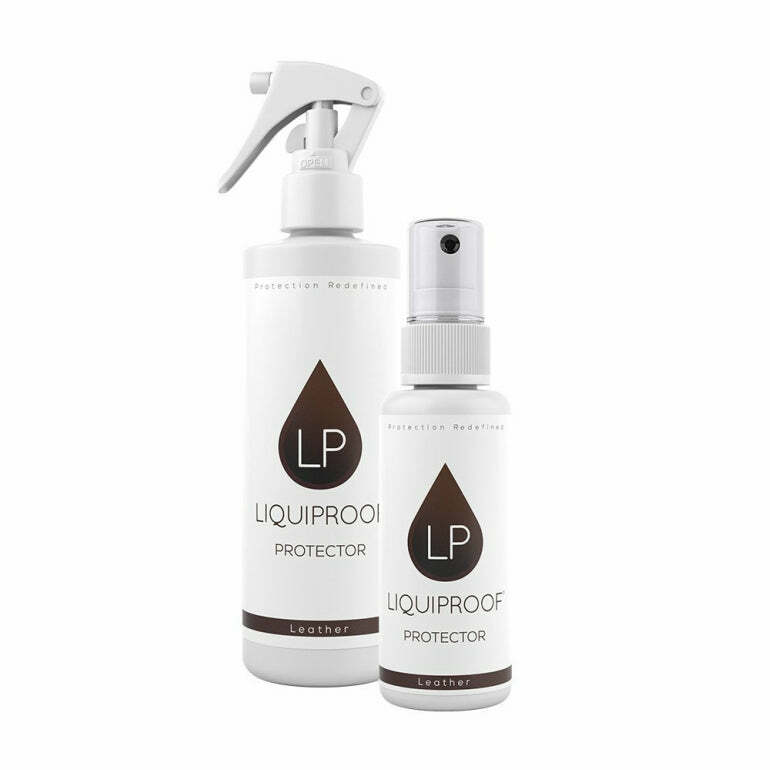 Liquiproof Footwear protector is a effective water-repellent spray that will keep your trainers from spills and stains without distorting their original look. The spray uses nanotechnology to product invisible water-resistant and oil-repellent formula, that can ultimately reduce the frustration of constantly ruining your shoes while also being able to save you money. 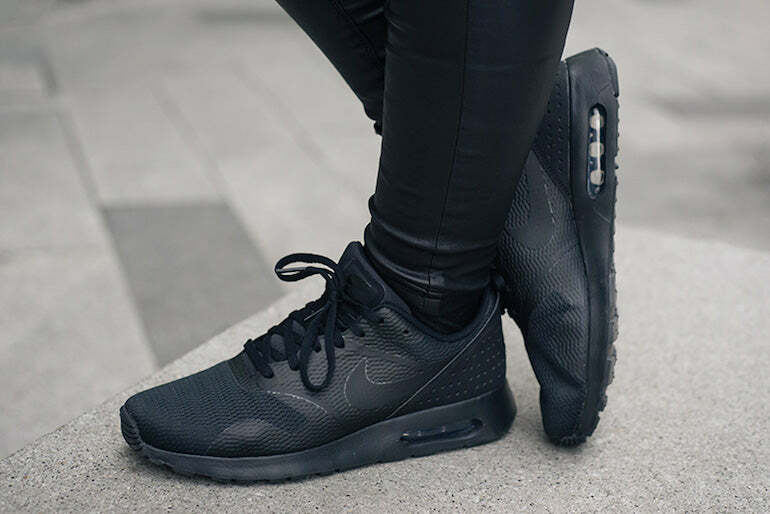 So, waterproofing your trainers will give them that extra jacket of protection and keep them unstained for longer making them the best waterproof trainers that are ready for every occasion. 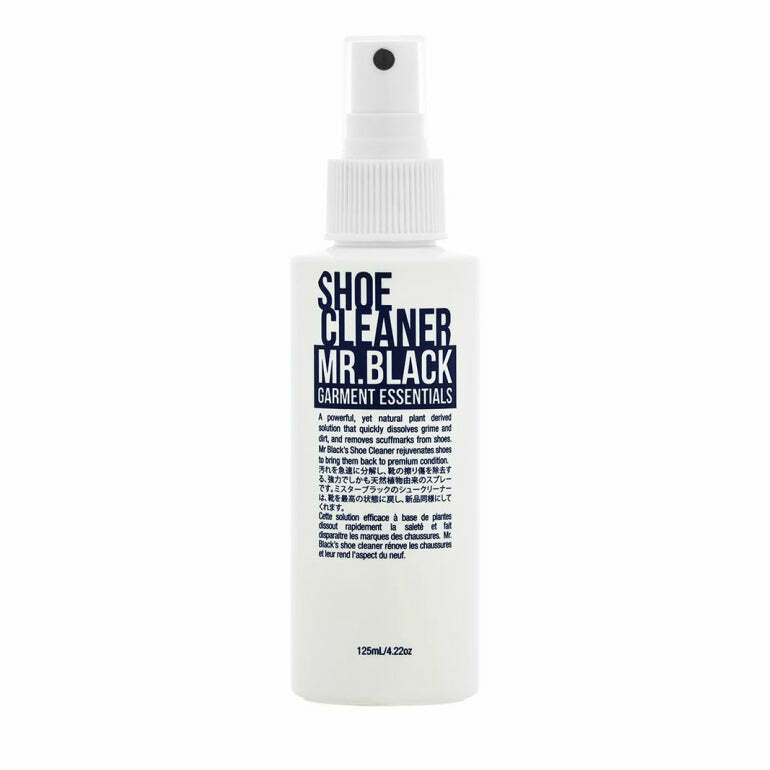 Mr Black shoe spray will give you that quick refresh your trainers need. Crep Protect cleaner is there to fully clean and give your trainers that new box newness. Shoe wax is an essential if you want to support a high sheen, clean trainer. Protecting your shoes is just as important as cleaning them. Waterproofing trainers will protect them from unnecessary stains and spills, making them look fresh. Looking after leather is important and if you want your new pair of trainers looking new for their entire lifespan then this is a vital part of taking care of them. Refreshing your leather trainers often will save you money and keep you on top of the trainer hype. Leather shoe care will soon become a part of your lifestyle so why not get started straight away.